Not content with hammering all that cleverness into a stompbox, TC also ported it to the iPhone. And now, that app is at a 1.1 release. It’s all Retina display ready with snazzier graphics. It also has an interesting option to change the tuning graphics to yellow/blue for phone users with any red/green colour-blindness issues. There’s lots of other stuff shoved in there but there’s no time to waste listening to me drone on. 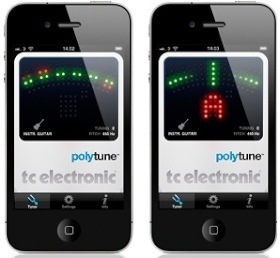 The PolyTune iPhone app is for sale from December 16th to 19th, 2010. During this time, you can get PolyTune for $0.99 (or local equivalent) from the app store. I’ve got it and tried it and it’s good. Off you go then. PolyTune for iPhone (iTunes link).